Underweight: 7 Tips To Gain Weight! Healthy weight gain can be as challenging as healthy weight loss. Although being lean can often be healthy, being underweight can be a concern if it's the result of poor nutrition or a medical condition. You should follow tips to gain weight. 1.Eat more frequently. 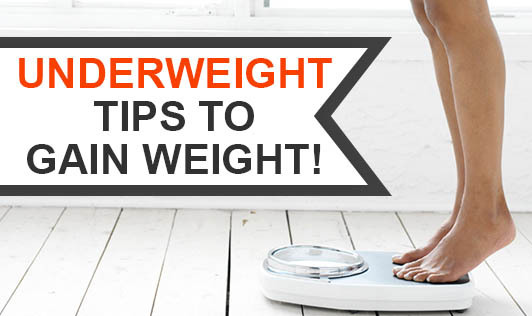 When you're underweight, you may feel full faster. Eat five to six smaller meals during the day rather than two or three large meals. 2.Choose nutrient-rich foods. As part of an overall healthy diet, choose whole-grains; fruits and vegetables; dairy products; lean protein sources; and nuts and seeds. 3.Try smoothies and shakes. Don't fill up on diet soda, coffee and other drinks with few calories and little nutritional value. Instead, drink smoothies or healthy shakes. Drink fluids either before or after a meal. Do not drink with food to avoid becoming full before you eat. 4.Add in calorie-dense snacks. Snack on nuts, peanut butter, low fat cheese, dried fruits and avocados. Have a bedtime snack, such as a peanut butter sandwich, sliced vegetables, oatmeal made with whole milk and lean meat or cheese sandwich. 5.Top it off. Add extras to your dishes for more calories - such as paneer in curries, soups and scrambled eggs, and milk or curd in stews. 6.Have a healthy treat. Even when you're underweight, be mindful of excess sugar and fat. Have healthy treats that also provide nutrients such as fruit flavoured curd topped with dry fruits. 7.Exercise. Exercise, especially strength training, can help you gain weight by building up your muscles. Exercise may also stimulate your appetite. Consult your doctor or a dietitian for an evaluation. Together, you can plan how to meet your goal weight!